Taiso Yoshitoshi (1839 - 1892) Hinamatsuri (Girls' Festival) at Shishinden Hall, 1880. Oban Triptych. 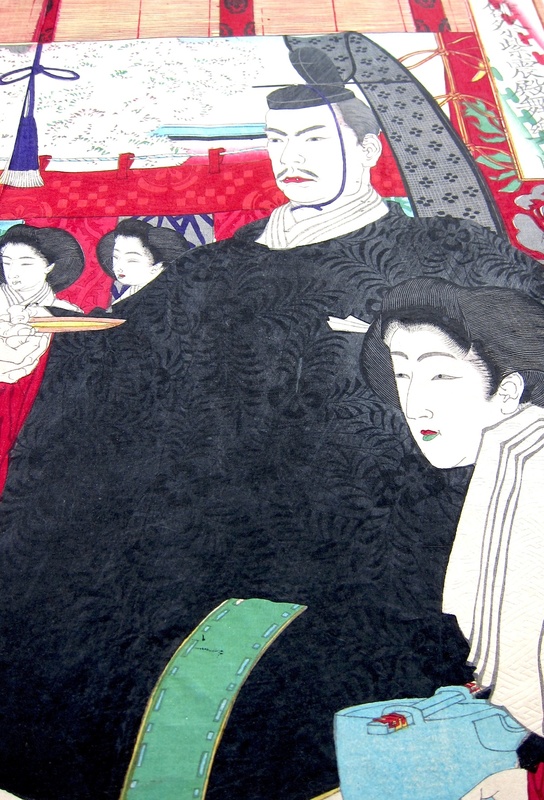 An impressive triptych by Taiso Yoshitoshi showing the Emperor and Empress attending a bugaku performance as part of the annual Girls' Day Doll Festival known as Hinamatsuri. The Royal couple dominate the right hand panel; the Emperor’s coat is richly decorated with black on black shomen-zuri (burnished) patterns. 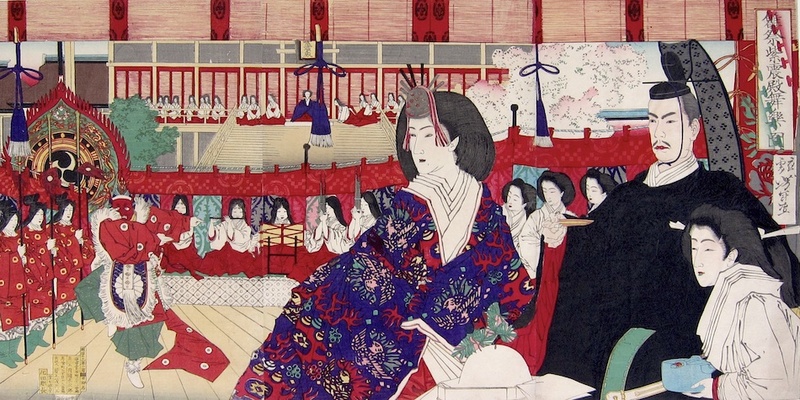 The background shows the precincts of the festival decked with rich red fabrics and in the left hand panel there is a rare illustration of the imperial bugaku dance of the noh theatre. Prior to the modern era this dance was held in secret for members of the Japanese elite for over twelve hundred years. The dancer wears elaborate masks and clothes and performs a story of the sun goddess. The girls' festival is still performed today; dolls of different rank, usually representing the court, are ranked on tiers of shelving later to be set on boats and sent down the river - taking illness and bad spirits with them. A fine Yoshitoshi triptych, three separate sheets full size and not attached. The colour and impression are both very good. Embossing and burnishing patterns to the black robes. Condition excellent. A copy of this print is in the Los Angeles County Museum of Art.